Photo management on the iPad is becoming more important. We’ll cover the new iPhoto and the new higher resolution iPad over the next couple days. Today, PhotoWall, a handy tool you may want on your iPad (Universal app, it will run on your iPhone too) if you need the power to create photo collages or photo/text documents. The work area is completely free form to place photos, art bits and text anywhere you wish. Each photo can be cropped, as well have it’s own framing of a solid color or texture. 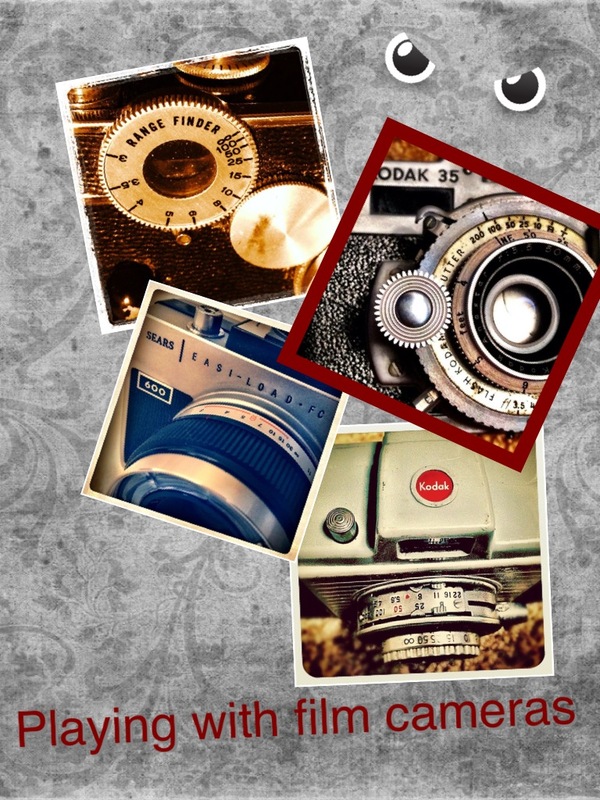 PhotoWall also offers photo filters to customize it’s look as your document needs. 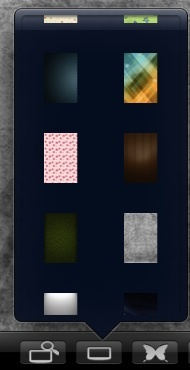 Along the bottom of the main work area page is buttons to access backgrounds – either solids, photos or textures. 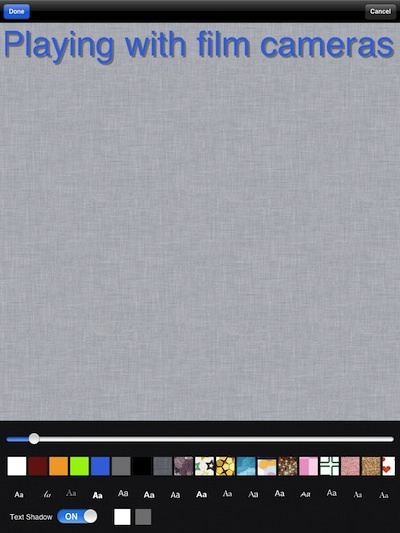 Next PhotoWall has art that can be inserted into the image. These can be moved/placed anywhere on the work area. These can be resized or twisted to match your needs. If you change your mind, just drag the art to the trash to remove. 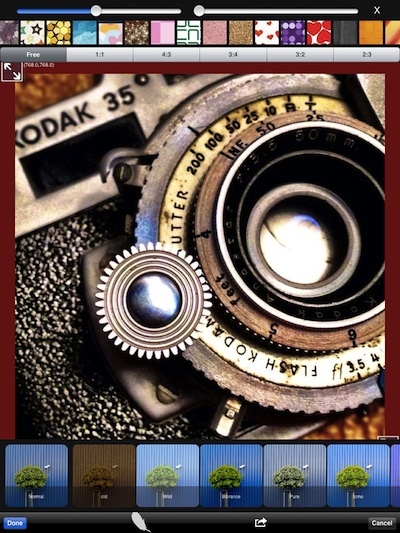 PhotoWall does offer an in-app purchase of many more art bits if you find the need. 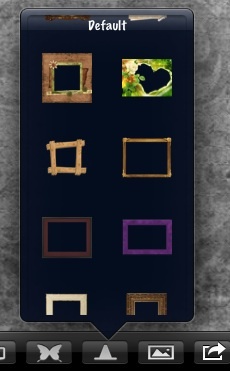 Frames can also be chose to insert in the photo wall area. A frame does not lock to a particular image. 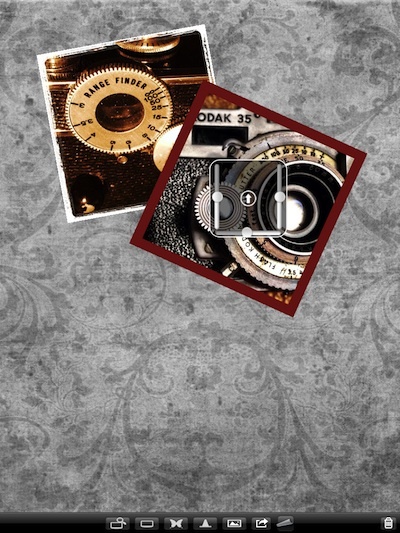 PhotoWall lets you pinch/expand and twist the frames to be placed around any picture you have on your background. When a photo is on the PhotoWall work area, you can twist, move and resize with your fingers. If you tap the photo, a box appears in the middle, the three sliders do the same as you can with your fingers and the center button will cause the photo to move over the top of other photos. 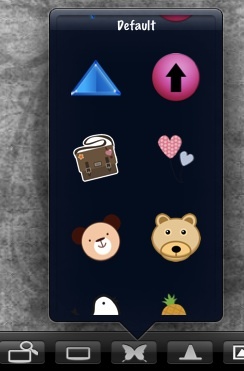 Text can be added to the photo work area via the button that looks like landscape. There are many options for the text; size, color, shadow and texture. After you choose Done, the text will appear on the picture page. You can drag it around the page, twist and pinch/expand for size changes. If you don’t like it, just drag the text line to the trash. The finished creation in PhotoWall can be exported to your iPad Photo Library (768 x 1024), send in an email, share through social networks Facebook and Twitter, Evernote and Tumblr.